Facilities for easy implementation of hybrid Bayesian networks using R. Bayesian networks are directed acyclic graphs representing joint probability distributions, where each node represents a random variable and each edge represents conditionality. The full joint distribution is therefore factorized as a product of conditional densities, where each node is assumed to be independent of its non-descendents given information on its parent nodes. 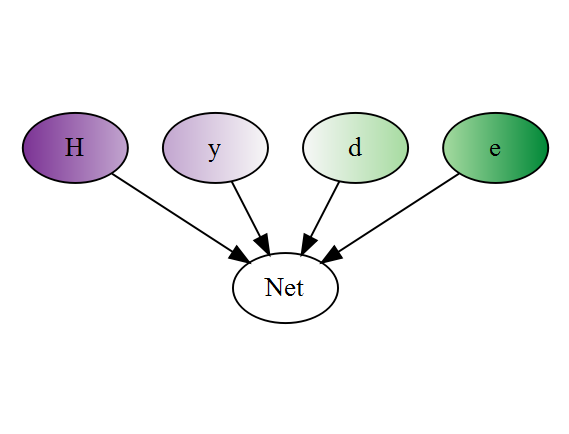 Since exact, closed-form algorithms are computationally burdensome for inference within hybrid networks that contain a combination of continuous and discrete nodes, particle-based approximation techniques like Markov Chain Monte Carlo are popular. We provide a user-friendly interface to constructing these networks and running inference using the 'rjags' package. Econometric analyses (maximum expected utility under competing policies, value of information) involving decision and utility nodes are also supported. Update plot.HydeNetwork to accommodate changes in DiagrammeR. Added methods for survreg models. The predicted value returned is the predicted survival time. Added dependency to pixiedust to allow better parsing of term names. This also resulted in removing the dependency on broom (which is alright, because pixiedust depends on broom. Corrected a serious bug in how character values were handled in the data argument of compileDecisionModel. Adds factorFormula to assist in writing formulae that make use of factor levels instead of their numeric codes. Deterministic nodes are now represented as diamonds by default. Changes to plot.HydeNetwork relevant to changes in DiagrammeR 0.8.0. Note that the column names in custom node data frames no longer contain node_id but use nodes instead. However, the HydeNet function arguments have no changed names, in order to maintain compatibility with 0.9.0. Future versions may allow for either node_id or nodes to be used. In custom edge data frames, edge_from and edge_to are changed to from and to, respectively. Minor bug fix related to creating policy matrices with nodes that don't have a 'nodeFitter' specified. Fixed a bug in compileJagsModel and compileDecisionModel that prevented cpt objects from being passed to JAGS models correctly. Added nodeData argument to setNode. Added imports from utils and stats to comply with new CRAN policies. Incremented to version 0.9.0 for CRAN release. Fixed a bug preventing bernoulli values from being passed to cpt arrays in the JAGS models. Streamlined the generation of the factorRef element of the compiled Hyde Networks. This also allows all data frames in all nodes to be included to generate a complete list of factors throughout the network (previously, it only generated references for factors in the overall data element, not the nodeData elements. Minor changes to GettingStartedWithHydeNet vignette. Added VignetteBuilder option to the description file. For now, when reinstalling the package, use the command devtools::install_local([directory]). If you try to build the vignettes with the package, a strange error occurs that prevents the installation. This error is related to the WorkingWithHydeNetObjects vignette, but I can't reproduce the error outside of the build command. setNodeModel and writeJagsFormula methods are complete. compileJagsNetwork retrieves cpt objects to include in the data argument, allowing JAGS to compile without the user having to remember to assign the cpt object to the data. cpt function is added to assist in developing multidimensional conditional probability tables. cpt and cptInput are generics with methods for list and formula. Their structure is undergoing some growing pains right now, so expect more changes in the future. Improvements to efficiency of compileDecisionModel. Consolidated all data documentation into a single file. HydeNetwork chooses cpt as the fitter for variables where the node is a factor and all parents are factors. Added modelToNode.cpt. This is untested as of yet and may be buggy. Final changes are pending the finalization of the cpt objects. An additional argument is used in writeJagsModel and modelToNode that is required by an unexported function matchVars. Added a message to indicate that character strings defining parameters in setNode are not validated (Issue #24). Updated BlackJack network object to be consistent with the object defined in the Decision Nodes vignette. Now Imports on broom (>= 0.3.7). This makes sure that the multinom tidiers are available. Updated the HydeNetPlots vignette to accommodate new plotting features. Revamped plotting utilities to make use of the DiagrammeR package. This makes the full range of GraphViz available for use. Implemented policy matrices into compileDecisionModel and fixed all the bugs that popped up in doing so. Changed the name of the Black Jack training data from bjdata to BlackJackTrain. Added documentation for it. Adds functionality to customize plot defaults. Adds functionality to customize nodes in plots. Added the BlackJack data object, which contains a HydeNetwork object simulating a game of black jack. Included a vignette showing off the use of plotting methods. Fixes Issue #10 dealing with utility nodes not being properly initialized and set. Added a new dependency on package dplyr and magrittr. This was done to make dplyr available for joining MCMC matrices returned by coda.samples. Modified compileJagsModel to accommodate compiling multiple JAGS models when a policy/decision matrix is provided. Added the function HydePosterior, which generates posterior distributions of all of the JAGS models compiled by HydePosterior. Added a function to bind all of the MCMC output from HydePosterior into a single data frame. Addressed a bug in compileJagsModel that affected observed data values. (Issue #36 on GitHub). Addressed a bug in modelToNode that printed the node name in the first parameter, causing compileJagsModel to fail. (Issue #35 on GitHub). The primary additions to this developmental change are the addition of decision nodes. Each node now has a new descriptor (found in network$nodeDecision. It is a logical value indicating if the node should be considered a decision node. The behavior of decision nodes is exactly like all other nodes in every respect until you call the compileDecisionNetwork function. compileDecisionNetwork evaluates all of the decision nodes, builds a table of all combinations of decision options, and systematically runs compileJagsModel for each row of that table to create a JAGS model for each combination of decisions. Decision nodes can be defined in setNode, but for convenience, a new function is introduced (setDecisionNodes) to allow multiple nodes to be defined as decision nodes in one call. This is intended for use when a list of models is used to define a network. Additional bugs have been corrected while uncovered during the testing of decision node features.